Opened in November 2008, At Home in Maine is the museum’s largest new exhibit in over twenty years. Its significant and varied domestic artifacts tell stories of Mainers at home throughout history. In At Home in Maine, discover the nearly-forgotten summer kitchen, hear traditional music, watch home movies, glimpse treasured possessions, experience the hard work of housekeeping, appreciate indoor plumbing, share memories, and learn about the many other, sometimes unique ways that life at home in the past has shaped today’s Maine. 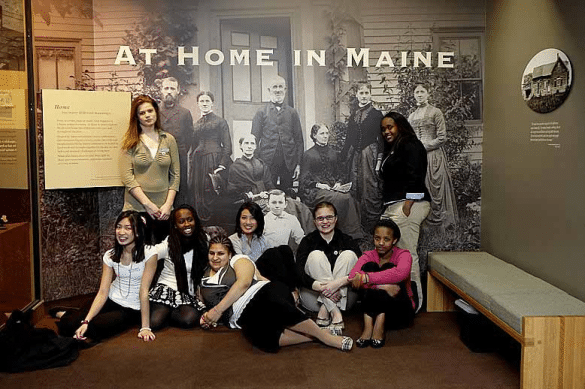 At Home in Maine was made possible by major funding from the National Endowment for the Humanities, an advised fund of the Maine Community Foundation, Elsie Viles, anonymous in recognition of the work and interest of Diana M. Gibson, TD Banknorth and Foundation, Members of the Maine State Museum Commission, Board of the Friends of the Maine State Museum, and many individuals, businesses, and organizations who contributed funds and services.